Readers to Eaters, 9780998436616, 32pp. The first zucchini of a summer garden is always exciting, but what happens when the plants just keep growing...and growing...and growing? 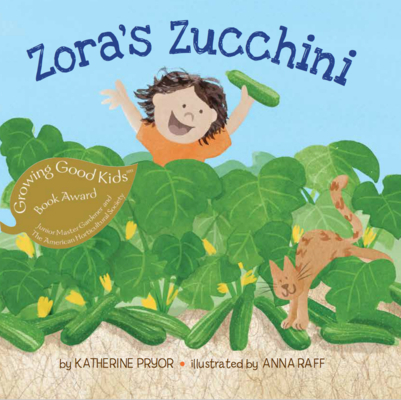 Zora soon finds herself with more zucchini than her family can bake, saute, or barbecue. Fortunately the ever-resourceful girl comes up with the perfect plan--a garden swap Author Katherine Pryor and artist Anna Raff followup with their first book, Sylvia's Spinach, with this playful story of a child who discovers not only the wonder of growing food but the satisfaction of growing a community. Shelf Awareness, says "Zora's Zucchini satisfies every appetite with its clean, happy storyline and whimsical illustrations." and Tom Watson, EcoConsumer, writes "We'll never make headway with the pressing environmental issues of our time - such as climate change, community-building and food waste - without brilliant, fun little books like Zora's Zucchini ." A Whole Kids Foundation Book Club selection for April 2016. Katherine Pryor made her picture-book debut with Sylvia's Spinach. A particularly bountiful August harvest in her Seattle community garden inspired her to write Zora's Zucchini.Anna Raff's family grew zucchini in their garden when she was a child. Now she raises succulents and cacti in her New York City apartment. She illustrated Sylvia's Spinach and many other children's books.